Tuesday 12th December 2017, London, UK – One of the most sought after celebrity creative director’s Anisha Vasani hosts a spectacular Fashion Brunch, in aid of charity. Hosted in Haymarket’s fine dining experience, Mint Leaf restaurant and bar, the brunch saw a dazzling lineup of designers from Gursharon Bird Designs, Rubina Kapoor to Amishi. 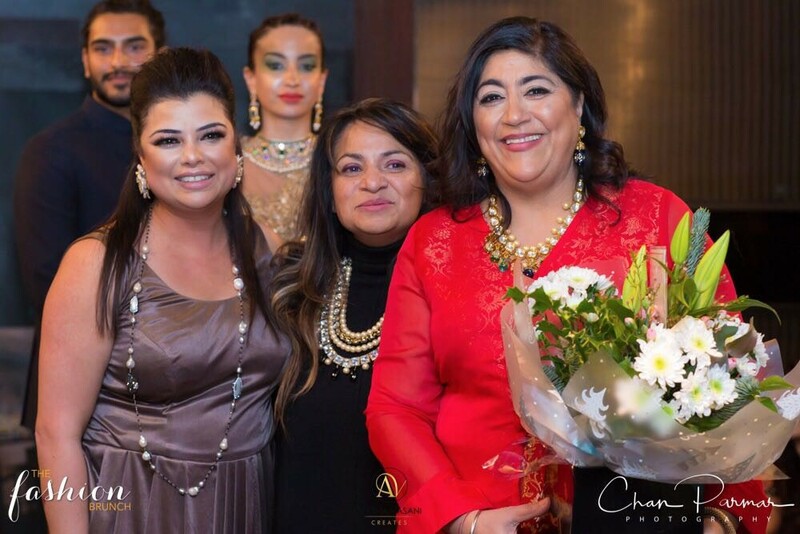 The star-studded event was attended by Pakistani Actor Aijaz Aslam, apprentice star Bushra Shaikh, Gurinder Chadha OBE and model/actress Ellen’s Fernandes to name a few. The prestigious and highly awaited event was attended by hundreds of fashion and style enthusiasts, despite the start of a snowy winter, who were greeted with a champagne reception & a mouth watering 4-Course Brunch, followed by a Luxury Fashion catwalk, showcasing Winter/Spring collections of trendy ensembles & glamorous attire, designed by Leading couture & Aspiring Bespoke fashion designers. The Designers included: Gursharon Bird Designs and Roots Jewellery with celebrity showstopper Gurinder Chadha OBE who certainly surprised a packed crowd followed by a showcase from Nikazah alongside Sukrani Jewels, Mahirra married to showcase their collection with Bling to Be, Sejal Anujsh Shah and gorgeous teamed accessories from Amishi, with a Finale from Khubsoorat by Mani Kohli, introducing Gee Sin and complimented with Exquisite Jewels by Rubina Kapoor. Hair and makeup was provided by Roshni Hair & Makeup team, who did a marvellous job on all the models. Visitors were treated to beautiful VIP Shopping Experience at the Designer lounge with Christmas accessories & shawls by the designers, who were showcasing their collections on the catwalk and the Christmas feel was in full swing of Champagne and an amazing live saxophonist who was working his magic around the venue, playing the best in Pop, RnB and Bollywood songs. The Fashion Brunch, which is in its first year, was created by Anisha Vasani, who began her creative and branding consultancy Anisha Vasani Creates in December 2016. The event was in association with Jack Harvey London and Rubina’s cancer charity partner Marie Curie UK, where proceeds from ticket sales were donated to the charity. After the very first successful show at Mint Leaf, London – where the whole restaurant was turned into a wonderland for discerning fashionistas – we look forward to inviting you to the next event Fashion Brunch in the New Year!.